Ancient Forest Alliancee campaigner and photographer TJ Watt by the ninth-widest big-leaf maple in B.C., in the Mossome Grove near Port Renfrew. 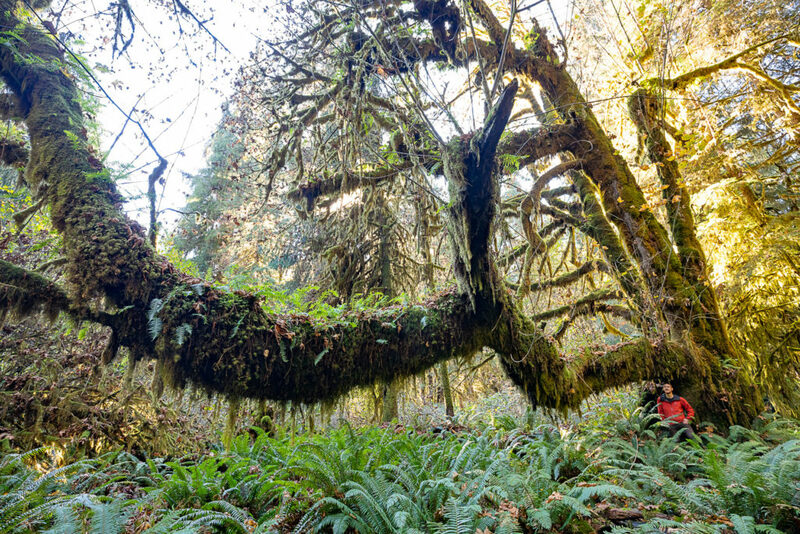 A six-hectare parcel of old-growth forest in the San Juan River Valley, near Port Renfrew, has been dubbed Mossome Grove (a combination of “mossy” and “awesome”) by the conservationists who recently came across it. It includes huge old-growth Sitka spruce and big-leaf maples adorned with hanging moss and ferns. At present, most of the grove is unprotected. It is on Crown land. Ken Wu, executive director of the Endangered Ecosystems Alliance, said the site is special. For now, those who found the grove are not saying exactly where it us, Wu said. Included in the grove are the ninth-widest Sitka spruce and ninth-widest big-leaf maple in B.C., Wu said. He said second-growth forest dominates much of the B.C. landscape, so it’s important to protect the major old growth that is left. Wu said the provincial government is working to establish a new old-growth management policy.